Reflections of a Grady Doctor: Ms. Acquilla and Grady. Ain't there something I can give in exchange for everything you give to me? When I was in college at Tuskegee University, I befriended a woman named Crystal C. Crystal lived in the same dormitory as me and the following year, we pledged sorority together. 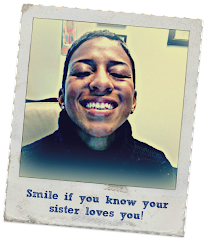 Since Crystal is from Atlanta and it was only two hours away from teensie-weensie Tuskegee, it was nothing for all of us to pile up into a car and road trip to her home for the weekend. We'd crash all over the apartment of Crystal's single mother, Ms. Acquilla. Lucky for us, Ms. Acquilla never, ever seemed to mind. Us as college girls--isn't all that hair funny? Over the years, I always stayed in touch with both Crystal and her mother. In fact, when I started working at Grady, I used to see Ms. Acquilla volunteering in the lobby with a bunch of other people. She'd throw back her head and laugh this raspy laugh that was unmistakably her own. "What are you doing here?" I recall asking her that first time. 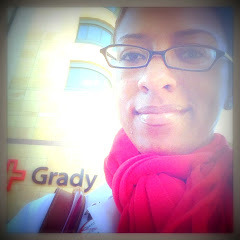 "Giving back to Grady. It's given so much to everybody else." Of course she was giving back to Grady. Because giving was simply her way. 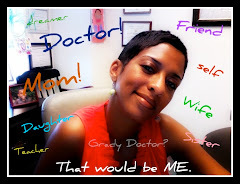 One day, Crystal asked me to help get Ms. Acquilla seen at Grady because her insurance had lapsed. She was dealing with some blood pressure issues and also a bit of carpal tunnel, maybe. Crystal acted like it was a big deal. And me? I just said, "Duh!" So I had the treat of seeing Ms. Acquilla and Crystal one Monday in our clinic. It felt like a homecoming of sorts more than anything else and since all of my residents were busy, I agreed to quickly see Ms. Acquilla myself. She'd lost some weight. That I noticed fairly quickly, but it wasn't substantial. She'd always been a slim lady so it wasn't anything too dramatic. "Have you lost weight?" I asked. Ms. Acquilla furrowed her brow and said, "You know? I feel like I have." Her blood pressure was no big deal. A little up but an easy fix. The "carpal tunnel" was less straight forward. For that reason, I went ahead and did a bit of a more thorough exam than originally intended. And so the story goes--a story that many know well by now because I've written about it before--that exam would prove to be a life-changing one. While facing her and palpating first, her neck, and next, the soft tissues at its base, I found it. Left supraclavicular region. A firm, fixed lymph node. In a place where lymph nodes should never, ever be living. And so. With my fingertips on top of Ms. Acquilla's clavicle and her eyes looking deeply into my own, I quickly welled up with tears. "Is it something bad?" she asked. Then I broke down right then and there and cried. Hard. Because I knew that Ms. Acquilla's raspy laugh had come from years of smoking. I knew that all those years might explain what I was feeling above her collar bone. And that it was bad. But even worse--it might explain why her hand was so weak and not carpal tunnel at all. Damn. Could whatever this was have spread to her brain, too? 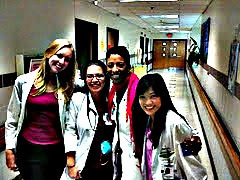 Two hours later, Crystal, Ms. Acquilla and me sat in a clinic room as I confirmed all of that to be so. I'll never forget it. I cried and cried as I explained to Ms. Acquilla what this all meant. And she was stoic and strong and tender and easygoing, just like she was when we used up all her toilet paper and left Kool Aid on her counter tops way back when. "It's okay, baby. What do we do next?" 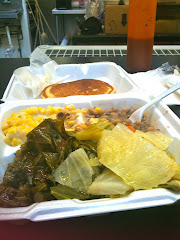 "It's so good you work at Grady. Don't you know that you did more in two hours than another hospital could have done for me in two months?" I thought about that. She had a point. Her appointment was at 9 that morning. When I felt that lymph node, I told my colleague working with me that morning about it and she called someone in Pathology. That person immediately came up and did a fine needle biopsy and took the specimen straight to the lab to review. Another call was made to the Radiology suite where another colleague quickly got her in for a head scan as well as the chest x-ray that would demonstrate the source of it all right there in her lung. Lung cancer. In two hours. So yeah. Maybe we did find it out quick, but what we found out sucked. And it sucked more because I loved her and knew her in a deep and meaningful way. By noon, I had an appointment for her to be seen in Oncology. And according to Ms. Acquilla, they were good to her. So good to her that she always said she was thankful to God for making her lose her health insurance when she did. I've told this story before. Not here, no. Ms. Acquilla gave me permission to write about her so I told her story in the Annals of Internal Medicine a few years back. But what got me thinking of this story was me speaking with Crystal the other day on the phone when she reminded me of something I'd forgotten. 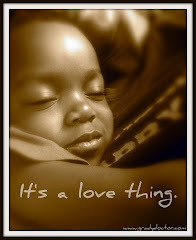 "I'll never forget the day I was going to move the car after taking Mama to chemotherapy. Remember? The big 'Save Grady' rally? I didn't even know it was going on!" "Remember Kim? Right outside of the hospital doors. And right as I was coming out of the door, they called your name as the next speaker. Remember? It's crazy how the planets aligned for me to be right there as you were walking to that podium." That was back in 2007. There was a real, true threat that, due to financial woes, Grady Hospital was at risk of closing. For real. So an utterly amazing group of medical students (yes, MEDICAL STUDENTS!) galvanized a movement that was quite comparable to the SNCC of the Civil Rights Movement. For real. HealthSTAT -- Health Students Taking Action Together. That's the student group comprised of Emory, Morehouse and some other Georgia health students, too. HealthSTAT is a great organization. Which you TOTALLY should consider giving to if you're ever looking for an excellent non-profit to choose for your philanthropic efforts. This organization is certainly one of mine. Oh--and shout out to this year's president, Kevin S.
But I like, totally digress. So yeah. 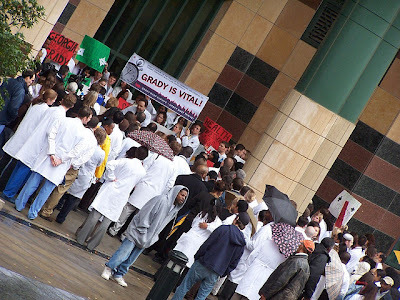 HealthSTAT had this big campaign going called "Grady is Vital" and as a part of it, had organized this rally right out in front of the hospital. As a part of it, they asked some students and a few faculty members to speak. 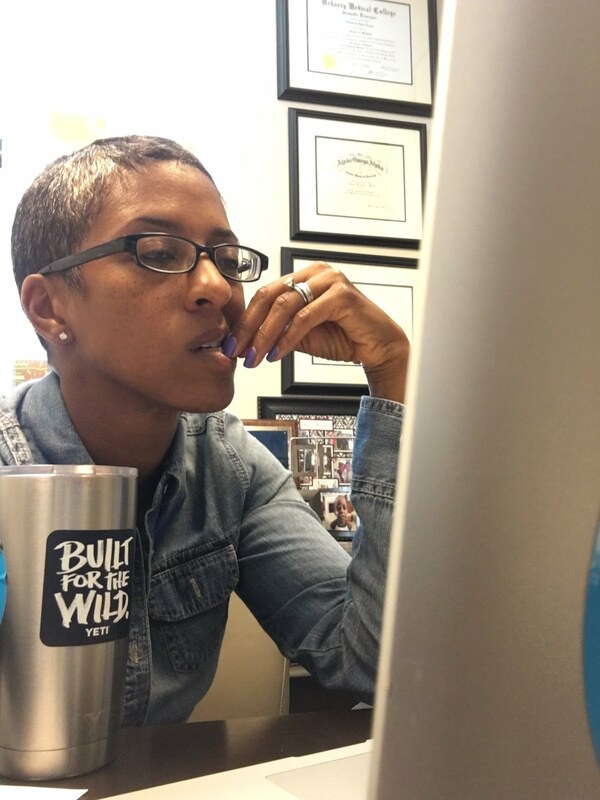 The idea was to have us talk about personal reasons why Grady was vital to our community and to us specifically. The moment they asked me to speak, I knew whose story I would tell. 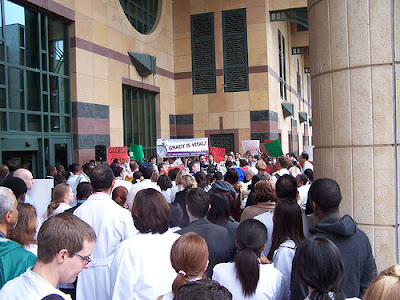 The HealthSTAT students that day in front of Grady. And so I did. 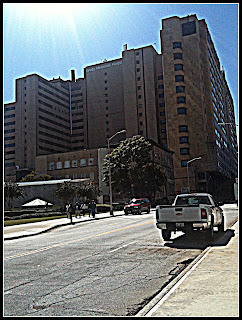 I stood at that booming microphone and told that entire story and about all that Grady Memorial Hospital did in just two hours to make that diagnosis. I let them know that she regularly volunteered at Grady and I told of the Oncology doctors and nurses and even the pharmacists who assisted Ms. Acquilla. I spoke of how grateful she was and did my best to impart what I felt Ms. Acquilla would if she were standing right there and not upstairs connected to her chemo drugs. And the planets aligned so that Crystal was there to hear it. And film it. And ultimately show it to Ms. Acquilla. I'd forgotten all about that until she mentioned it last week. But I'm so glad she did. It reminded me of why I feel in my soul like I was born to work at Grady. Of why it feels divine. . . .almost like my steps have been ordered to this place just as Crystal's were in that moment as I spoke of her mother. Crystal and I were together the night Ms. Acquilla died. In that same southwest Atlanta apartment that we'd overtaken weekend after weekend. Perhaps in that same room even. We'd sat with a few other friends until late into the night as Ms. Aquilla's breaths became shallow and gurgly. I had an early morning so Crystal walked me to the door. "How much longer do you think she will do this?" Crystal asked. And I could tell she was serious. "Crystal? I think she knows you'll be okay now. It's been just the two of you for so long that I think she just needed to know for sure that you'd be fine. You were laughing tonight. You seemed okay and my guess is that she heard all that." And Crystal understood what I was saying. Over the years I've learned that when people are at peace, they are okay with letting go and making their transition. A hard fight happens when they're waiting for that contentment. If they're lucky, they get it. 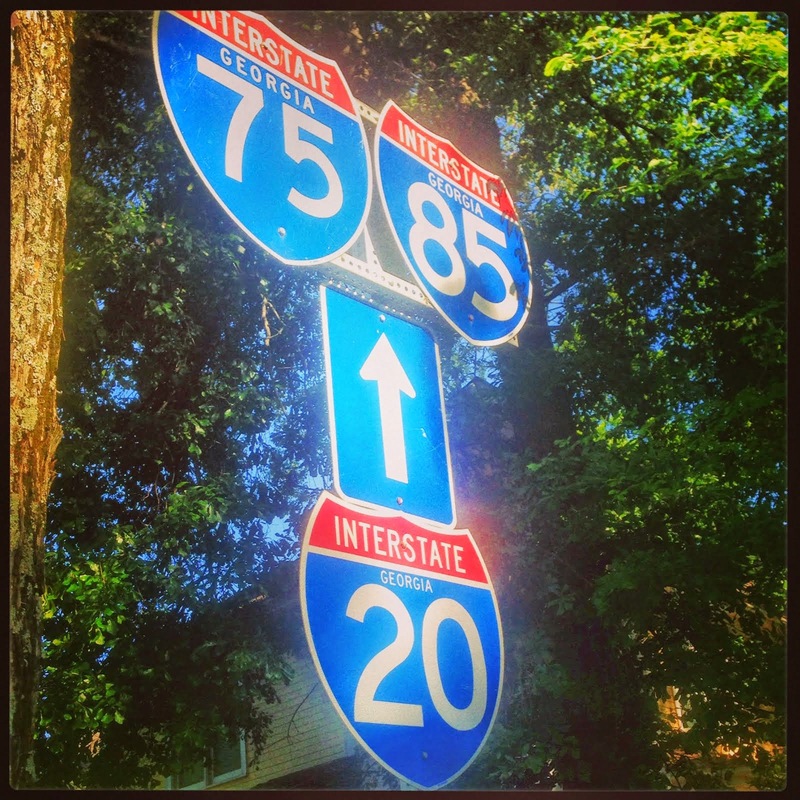 I wasn't even to interstate 20 when my cell phone rang. She was gone. 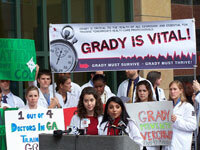 The "Grady is Vital" campaign was a big success. Grady stayed open. And Ms. Acquilla outlived her prognosis by over a full year. And you know? All of this--all of it--is a piece of Grady, too. And it was just as Ms. Acquilla would have wanted it. I guess that's why I wrote about her today. To give you a piece of her wisdom, too. Now playing on my mental iPod. 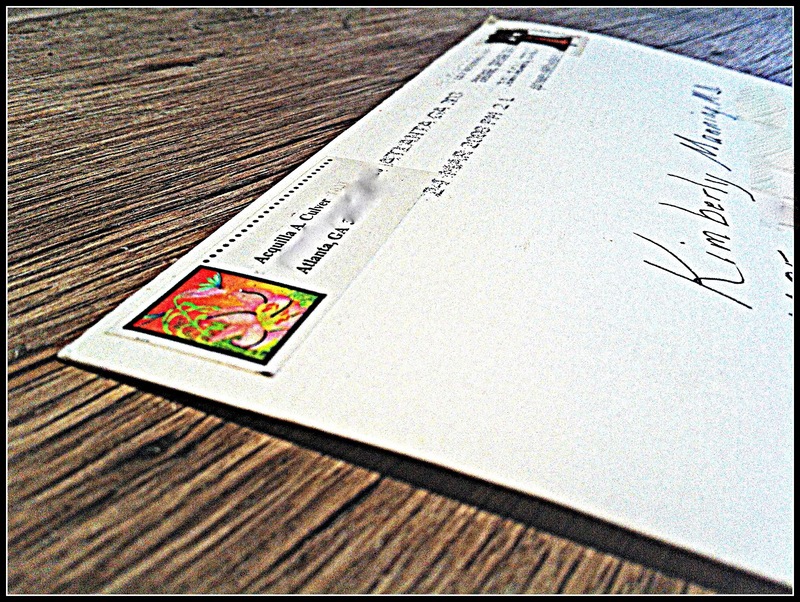 . . . . this one is for you, Ms. Acquilla. And you, too, Crystal. 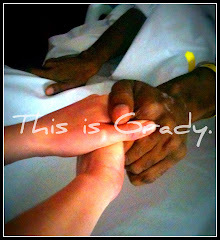 I'll always be glad it was Grady, too, and that we were all there at that appointed time to take care of each other. Ms. Anita Baker spoke to my soul with this song as I thought of you. . . "Giving you the best that I've got." Wonderful story -- and I can't help contrasting your full-hearted diagnosis of Mrs. Aquilla with my baby's diagnosis so many years ago at NY Hospital -- I recently posted about it, so it's fresh in my mind despite the seventeen years that have passed. Know that what you do and how you do it matters so much to so many people and that they will remember you forever and ever in the most beautiful of ways. This means a lot coming from you. I feel so fortunate to have been involved in Ms. Acquilla's care. I hate that someone was so careless with your experience with Sophie. 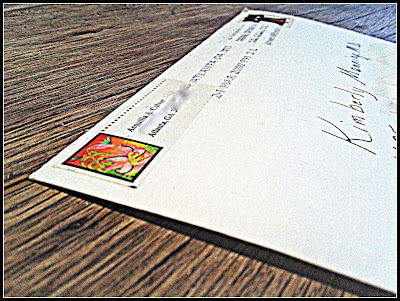 Love to you, my dear. So many teachings in this story. When it's time for my parents and me & hubs' grandparents to go, I hope they have people who care as much as you and your team. Thanks, Jameil. I hope I can be to my parents what Crystal was to Ms. Acquilla. What a powerful friend and ally you are! You and Grady. You are exactly where you're supposed to be. How many of us can say that? I was so lucky to know her. She made me feel so safe and not silly at all when I blubbered all over that clinic room. Yes. Me and Grady were meant to be. I'm thankful for that. 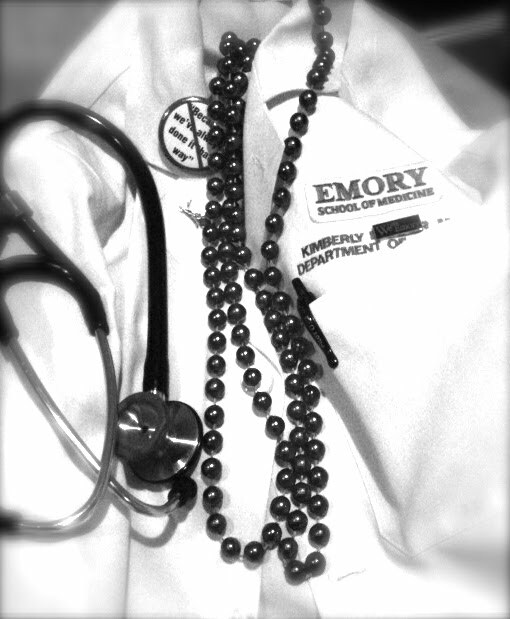 To one of Atlanta's finest doctors, Dr. Kimberly "Back Inc." Manning of Grady Hospital. I too, often think back on that day I so vividly remember of the "Save Grady" demonstration and seeing you at the podium speaking. 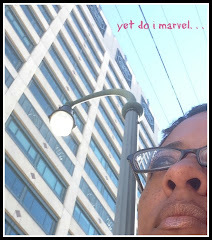 I had just dropped mom off for chemo and was sort of being noisy at the commotion outside and... was totally stunned with tears beaming from my eyes as you spoke of my mother and how much she enjoyed volunteering at Grady. Dr. Manning, your medical disposition and hospitality to all of your patients, their families is so note-worthy, and should be highly commended for every medical professional. So glad, God saw fit to place His angel (Dr. Manning)at the right place at the right time! Most of all I am glad I know her personally! God Bless you Dr. Manning, may every seed you have sown in the lives of patients be restored unto you and your family 100 fold! I look forward to reading your blog every day just as a child looks forward to a bedtime story by their favorite person. I say person because it could be a parent, a grandparent, a sibling, a babysitter - anyone. Now I guess, it includes my favorite blogger. I loved Ms Acquilla's story, the life lessons in there and all the love that you've put into framing each sentence so that we can see the person and not just the patient. Everything happens for a reason... Very powerful post. This IS Grady. Yes, it is. I think this is my favorite story yet. Beautiful. Thank you for taking care of Crystal and Ms. Aquilla. You are in MY house with the oncology patients. Although I am not a physician, I know the sinking in your stomach feeling you get when you take a history and know, just know, the news will not be good. One of the SEPTA buses in Philadelphia has the slogan.."where you go (first) matters" to promote Fox Chase Cancer Center where I work. In your case, Ms Aquilla went to you first and that made all the difference. You know she lived every day she had and went home when her days were done. God bless you for making her days brighter. I am not a physician, but I know the sinking-in-the-stomach feeling you get when you take a history and know, just know that the story will not end well. My hospital, which is the nations's first cancer only hospital, has a slogan on SEPTA buses which reads.."Where you go (first) matters". Ms Aquilla went to you first and that made all the difference. She lived every one of her days and went home when it was time. Thank you for what you did for her and her daughter. I have learned MUCH more from my oncology patients than anything I ever did for them. I suspect you feel the same about your FP's. Pardon the double entry. I didn't think the first one went through. Rookie mistake! I have run out of ways to tell you how amazing and inspiring you are... my (not to be boastful, but it's not small) vocabulary falls woefully short while the ways in which you continue to inspire persistently multiply. How DO you DO what you do, Grady Doc? You are so amazing with words that one cannot read your stories without hearing your voice, smelling the smells and feeling the touch of your genuine spirit? Pain is a tough thing to convey gently, but you do it - time after time - as carefully as a surgeon (wonder where you get that from?!) 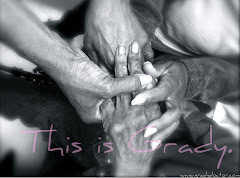 thank you for Ms Acquilla's story - and for loving Grady so much that you are that rock for so many.